Not because she's a woman — because she's a human being, and no human can be as powerful as Superman. We caught up with the Man of Steel last weekend at Comic-Con, and asked him about the Clark-Lois dynamic going forward. What he said kind of surprised us. The Man of Steel makes a pretty big change to Superman lore from most other versions of the character — Lois knows that Clark is Superman from day one. How will this change things between the characters in the sequel? We asked. 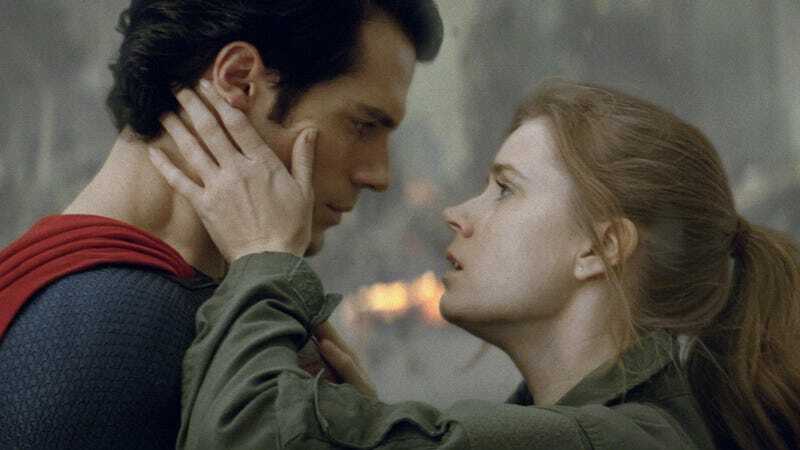 "I think it's essential" for Lois to know Clark's secret, says Cavill. "Because if we're trying to base it reality, there's no way that Lois has these direct interactions with Superman, and then doesn't recognize Clark sitting next to her in the office. If she falls in love with Superman, and she's ignoring a guy who looks just like Superman, behaves just like him, and has the same kind of mannerisms and behavior, then what does that say about Lois? I like this relationship. She saves him just as much as he saves her." Then we asked, "So you want them to be more equals, basically." And he sort of shook his head at that. "More equals? Well... Can you be equal in power to Superman? I don't know." We suggested that they could be equal in emotional power, and he seemed about to argue, then settled on, "Yes. 100 percent." Meanwhile, the very final five minutes of Man of Steel are much lighter in tone than the rest of the movie, with Clark going to work at the Daily Planet and meeting all his new colleagues. There's a friendly, jokey tone that's not in the rest of the movie. Would this set the tone for the next movie? We caught up with writer David S. Goyer at the same event as Cavill, and he said that we would certainly see more exploration of that world. "Look, if Man of Steel was kind of Superman Begins, then [in the end] we get him into the Daily Planet." So in the next movie, it would be natural to "start building out that world." This conversation took place before Batman Vs. Superman was announced, so we didn't get to ask him how Batman will change things, sadly. Meanwhile, Goyer said, "I can't answer any Justice League questions, sorry." It wasn't necessarily a comic effect that I was going for. I mean, I'm not looking at it from your perspective — how you see it — when I'm playing a character. I'm looking at it from a character's personal experience, and what he's going through internally. And at that stage of the story, he's finally reached the [point] where he can be himself. And someone's in on his secret, so he's not alone any more. And there's a different kind of energy behind that. There's no longer this sense of, 'I'm alone. What do I do? And now there are aliens invading, who are my people, who want to destroy my planet, and the people I've come to love.' It's now moved on from that. And so I don't see that as a chance to play comedy, I see it more as Superman evolving and coming into his own. And in the sequel, Cavill definitely thinks we'll see a more confident Superman. But at the same time, "When it comes to something like a threat to the planet, and people that he loves, it's not necessarily something you want to take lightly." In the middle of the dark situations that Supes faces, there may be some "gallows humor," but he won't know until he sees a script. And meanwhile, Goyer said his TV show Da Vinci's Demons is filming its second season, and you might see some stuff at New York Comic-Con. He adds: "We actually go to the New World. [There's] a lot more mayhem. A lot more 'what if' of history. A lot more demons... We have some pretty good 'holy crap' moments at the end of season two. And people seemed to really like [Count] Riario, so we have a lot of Riario in season two." We asked Goyer if he's ever worried about going too far in depicting the Catholic Church as evil, and he responds that the wild thing is a lot of this show is based closely on real history. "And Pope Sixtus [IV] was actually all real. So we're just sort of following history in that terms. But yes, that sort of fight between the Medicis and the church continues and boils over into all-out war. And meanwhile, we've got the Ottoman Empire lurking in the wings, still to come." And he said there are about five new series regulars joining the show, including a couple of guys involved in the Ottoman Empire, and a couple of Incas.